December 26th, 2007 Posted in excuses, holidays | 70No Comments »http%3A%2F%2Fwww.ecojoes.com%2Fthe-internet-is-slow-in-uruguay%2FThe+internet+is+slow+in+Uruguay2007-12-26+21%3A42%3A37ecojoehttp%3A%2F%2Fwww.ecojoes.com%2Fthe-internet-is-slow-in-uruguay%2F Make sure you like EcoJoes on Facebook to stay updated on green ways to save money and help the environment. Just click the "like" button below. Muchas gracias! That’s my excuse for not posting much of anything for awhile. Me and Tiff just got back from there, and had a grand old time. Uruguay was almost devoid of tourists, so we were usually the only Americans around. But that was great, since I got to practice my Spanish, and also it meant that it wasn’t all touristy with trinkets and such. Perhaps later I shall write more on this exciting excursion. But for right now, I shall sit back con mi yerba mate and contemplate el mundo. November 30th, 2007 Posted in green living, holidays, reusing, save money | 64No Comments »http%3A%2F%2Fwww.ecojoes.com%2Fhow-to-greenify-your-christmas%2FGreenify+Your+Christmas%2C+Fool2007-11-30+16%3A09%3A50ecojoehttp%3A%2F%2Fwww.ecojoes.com%2Fhow-to-greenify-your-christmas%2F Make sure you like EcoJoes on Facebook to stay updated on green ways to save money and help the environment. Just click the "like" button below. Muchas gracias! Just last night me and me woman put up our Christmas tree. 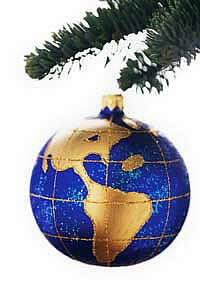 As I was hanging up the millionth ornament, I started thinking about Christmas in terms of environmental impact. Just think of all the packaging thrown away every year. All the trees cut down, screaming their silent tree screams that only Captain Planet and other eco-heroes can hear. As I started to silently weep, I clenched my fist with the determination that I would find a way to “greenify” this savage winter holiday. Most natural Christmas trees come from tree farms, so there is only temporary deforestation from their harvest. Plus, recent studies from my alma mater have shown that if Christmas tree farmers choose their pesticides wisely (or use organic methods), they can have a negligible environmental impact. Of course, once Christmas is done, most trees are just thrown out on the curb to be taken to the landfill. Plastic Christmas trees have a higher embodied energy; basically all of them are made from polyvinyl chloride. But they do last forever, so they can be reused all the way until the Earth finally blows up. I’d recommend looking around the inside of your house for a tree (real or fake) that you already have, and just decorating that. Skimp on the packaging. If you must wrap a present, do so by reusing some magazine or newspaper pages. ‘Tis the present that counts, not the packaging. Give non-material presents. Perhaps coupons for a massage, yard work, or the gift of friendship, if you’re really cheap. Make some food for them. “Wrap” it in tupperware or a metal tin that they can reuse. Give a green present. Perchance a low-flow shower head, a solar roll, or a nice compost bin. Carpool if you’re going long distances. This will cut your gas price, and give you some company on that long holiday drive. Ride a bike. Throw on your coat and hop on your bike if you’re just going a short distance. Sled or ski. If there is snow on the ground and you only have to go downhill, this is the tip for you. Ride a moped. Save money, use less gas, and spread holiday cheer as people laugh at with you. Hitchhike. Maybe Santa Claus will pick you up in his sleigh. What a story that’d be! Don’t forget to save energy and money this winter by following these simple tips. After thinking up these ideas, my eco-tears finally stopped, and I was able to resume hanging ornaments on our tree. Merry Christmas to everybody, and please give a hoot, don’t pollute.